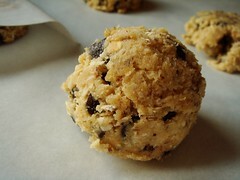 There is something strangely satisfying about a cookie packed with chunks of goodies and as big as the palm of my hand. To be honest, there is no shortage for this type of recipes. Some like to call it kitchen sink cookies. Cowboy cookie also comes to mind. So why was I drawn to the Chunky Lola Cookie from Joanne Chang’s Flour? I first heard of pastry chef Joanne Chang from her contributing article for Bakery-Style Muffin in Fine Cooking. Rather than yet another run-of-the-mill muffin recipe, her outline of a master formula with recommended customization to turn out dozens of different variations was both logical and refreshing. Recipe is merely guideline and she showed readers how to make it their own. Chang’s first cookbook has been on my wishlist for some time and I am happy to finally have a copy in my personal collection. The cookbook contains many of her bakery’s signature items. I especially enjoy reading the detail headnotes describing how a particular recipe was born and evolved. The name Chunky Lola apparently came from a naming contest submitted by customers and fans of the bakery. Who Lola is remains a mystery. What’s not a mystery is how come these cookies are popular. 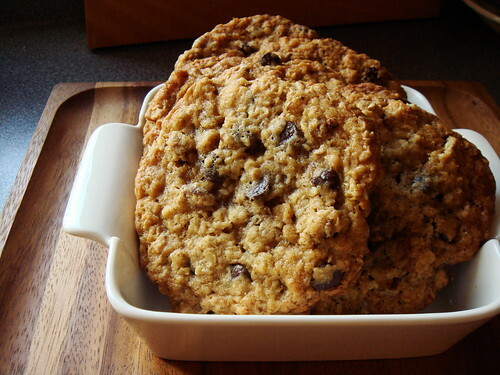 Jammed with dark chocolate chips, oats, shredded coconuts, and toasted pecans, every bite of these tender cookies offers something different but always decadent. Usually a busy treat like this can easily cross the line from cookie to candy bar. What I admire about Chang’s style is the balance of flavours and judicious use of sugar. Sweetness is not the dominate impression of these Chunky Lola cookies. 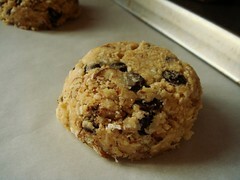 Rather, it is the harmonious combination of all the many ingredients that makes these cookies outstanding. 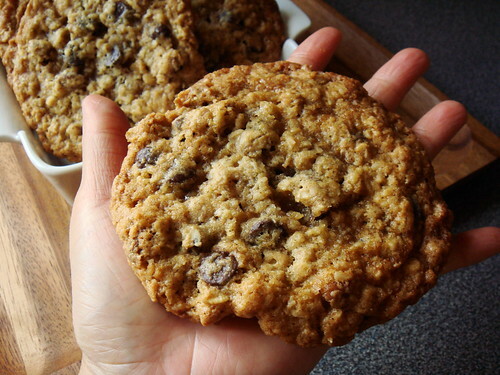 With 1/4 cup of batter for each portion, these cookies are huge. I used a regular size ice-cream scoop to shape the chilled dough. 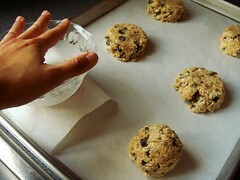 The recipe calls for slightly flattening each ball of dough with the hands. The way I did it was covering each ball with a square of parchment paper and gently pressed down with a flat-bottom bowl. The even pressure ensures every ball was shaped into a nice round disk. Drop cookies are easy to make and don’t require much time commitment. This recipe recommends overnight chilling of the dough before baking which is even more convenient for the busy home baker. On-demand freshly-baked cookies? What’s not to love?